Matthew 25: Ministries helps people all over the world after natural disasters. It started with a simple idea: get the right items to those who need them at the right moment. In practice, it takes many hands. Corpus Christi Mayor Joe McComb’s words came Thursday, August 24, as every social media platform and cable news channel in the nation began plastering screens with radar images of an ominous mass swirling over the Gulf of Mexico, just off the Texas coastline. Hurricane Harvey was moving rapidly toward land, carrying with it catastrophic rain, life-threatening floods, and devastation. In a matter of hours, coastal Texas grocery store shelves were plucked virtually bare. Residents, plagued by predictions of 12-foot-high storm walls and up to three feet of accumulated rain, drove as far as Houston in search of bottled water. That same day, 1,357 miles away in Cincinnati, sun beamed from a crystal clear blue sky. But in a cubicle in a nondescript warehouse in Blue Ash, Ben Williams was tracking the hurricane’s every move. He’s not a meteorologist, though he uses many of the same tools. He’s the disaster relief coordinator at Blue Ash–based Matthew 25: Ministries, and watching weather patterns worldwide is a huge part of his job. Looking for signs, warnings—anything Mother Earth will give him to help predict where the next big natural disaster will occur, how long it will last, and what kind of damage it will inflict. For 25 years, this Cincinnati-based nonprofit has been one of the world’s go-to organizations in times of disaster and for ongoing humanitarian aid. Founded by Rev. Wendell Mettey in 1991, Matthew 25: shipped more than 800 containers—or 15 million pounds—of donated goods last year to more than 20 million people in 30-plus countries. For reference, a container is a 40-foot-long metal structure—think of a trailer on a semi-truck— holding between 18 and 36 pallets, or nearly 20,000 pounds, of goods. Volunteers sort and process donations. Last year alone, the organization took in $206 million of donated goods and sent it all right back out again, to places ranging from New Jersey to El Salvador, greater Cincinnati, Tajikistan, and Tennessee. In Hurricane Matthew’s wake, they sent disaster relief to Haiti and North Carolina; they also sponsored the construction of typhoon-resistant homes in the Philippines and two schools in Nepal. All this work has not gone unnoticed. In 2011, Matthew 25: ranked first on Forbes’s list of 20 Most Efficient Large U.S. Charities and was ranked the nation’s number one 4-Star Charity by Charity Navigator. Today, per Forbes, they are the 75th largest charity in the United States; for perspective, that’s just seven spots below the JDRF and six spots ahead of the March of Dimes. The 60 full-, part-time, and seasonal people who work for Matthew 25: Ministries are not miracle workers and they cannot make anyone’s troubles magically disappear. They’re just regular people—fueled, as Mettey might say, by “divine providence”—who come bearing basic provisions in times of need: paper towels, work gloves, toothpaste, cans of soup, bandages, shovels, a clean shirt. But to survivors of fire, famine, tornado, and flood the world over—people without power, without clean water, without access to medical supplies, or clean clothes, and often without hope—the people of Matthew 25: Ministries are nothing short of heroes. On a Monday in late May a forklift horn toots, warning anyone nearby to step aside as the driver moves a pallet of boxes from one end of the warehouse to another. Overhead, exposed steel beams and fluorescent light fixtures are adorned in places with colorful strips of fabric or strings of holiday lights—all distractions from the cardboard-box and pallet-lined maze of donated goods that line the floor below: endless stacks of bottled water; thousands of rolls of transparent tape; giant reusable cardboard cartons, or gaylords, full of compression socks and flu masks; ceiling-high columns of mattresses; and a makeshift forest of artificial Christmas trees (props left over from a Christmas party for children with life-threatening illnesses). 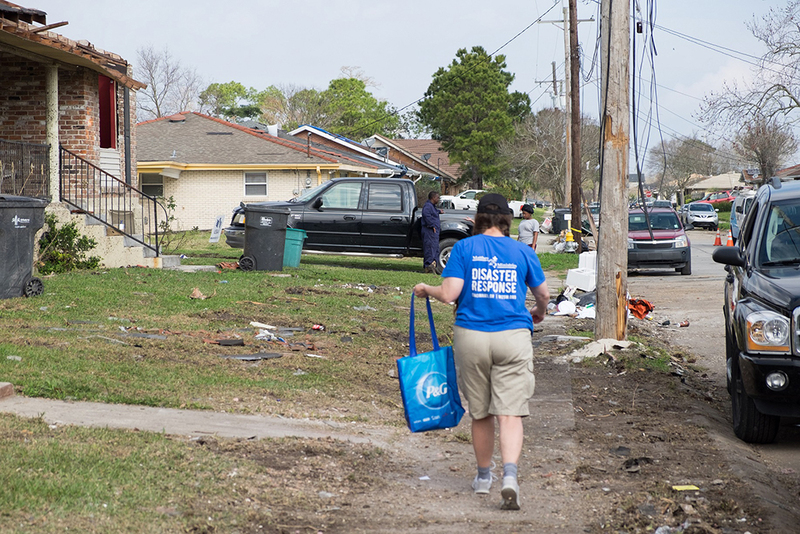 A member of Matthew 25: Ministries disaster response team carries personal care kits door to door. This group, along with dozens of others scattered throughout the Blue Ash warehouse (senior citizens, teens looking for service hours, mentally and physically handicapped people, and a bunch of random individuals who just walked in), has come to Matthew 25: Ministries today to do whatever it is the organization needs. Some days that means consolidating plastic jugs of soap donated by a chemical manufacturer; other days, it’s sorting maxi pads or shoes, sifting through bins of screen-printed shirts, even recycling paint. The seeming randomness of each day’s activity here is fitting, considering the way Matthew 25: came about. Wendell Mettey grew up in East Walnut Hills before it was fashionable. His father died when he was young, leaving his mother with very limited means, but Mettey was a fighter from the start; he overcame physical ailments and disabilities, earned a bachelor’s degree in economics, married his childhood sweetheart, worked in the late ’60s as a Hamilton County social worker, and earned a master’s of divinity in 1972. He then served as an ordained minister and pastor, first at the Walnut Hills Baptist Church, then at the Montgomery Community Baptist Church, until 1992. Mettey had no thoughts of changing career tracks when he went on his first mission trip to Nicaragua in 1990. What he saw there altered his life: people living in shacks, doctors with no medical supplies, children starving in the streets. It “was an overwhelming experience,” says Joodi Archer, Matthew 25:’s development and media director and program manager. Even after so many years living and working in Walnut Hills, she says, “he had never experienced poverty on that level—mile after mile. Endless.” Government officials told Mettey Nicaraguan teachers received just two pencils and 20 sheets of paper every year. Doctors told him hospitals washed and reused the same pair of surgical gloves every day. Mettey returned home determined to help. Within two years he quit his job, cashed out a chunk of his retirement account to pay for living expenses and founded Matthew 25: Ministries, named for the bible verses Matthew 25:34–40, which include the words: “For I was hungry and you gave me food, I was thirsty and you gave me drink, I was a stranger and you welcomed me.” His goal? Devoting himself full-time to gathering medical items and other supplies for the poor in Nicaragua. The early days went something like this: Mettey would cold call local businesses in search of products or supplies they could donate to Nicaraguans: pencils, bandages, anything. He’d pick it all up in his pickup truck and take it back to a 2,000-square-foot warehouse in West Chester. There, he sorted and packed everything—pretty much “all himself,” says Archer—in suitcases, which he’d later take to Nicaragua. During subsequent trips to the war-ravaged country, Mettey paid close attention to the way hospitals and other recipient organizations processed donated goods they received from other nonprofits. They’d sort everything into three piles, but in the end, only one of those piles was actually viable. The rest was always damaged beyond use and needed to be thrown away, a problem in and of itself, since most developing countries don’t have sophisticated waste management systems. From that day forward, Mettey vowed he’d send only first-rate stuff—all pre-sorted and neatly packaged. Within a year he sent 2,000 pounds of donated goods to Nicaragua. As the quantity of donations increased, Mettey enlisted unpaid help (this concept, of a volunteer workforce, later became key to growing his reach without increasing expenses). On Sunday mornings he’d invite friends, former congregants, and any other able-bodied humans for a worship service followed by hours of sorting and processing everything from donated shoes to medical supplies. By 1992 Matthew 25: was shipping these products to Nicaragua on industrial pallets—themselves often rescued from dumpsters—via Air Force cargo jets, courtesy of the Denton Program, which allows for humanitarian aid to be shipped on government planes. From that day forward, instead of just asking companies for donations, Mettey asked them for anything usable they were considering throwing away. Today, says Archer, “probably about 90 percent of the product we bring into the organization would have been landfilled or incinerated, despite the fact that it was brand new in most cases.” Hence, the organization’s motto: Caring for a needy world with the things we throw away. Here in Cincinnati, hours after Harvey made landfall, the Matthew 25: parking lot served as a makeshift live-shot hub for local television crews. Administrators had already been in contact with partner organizations in south Texas, but locals wanted to know what they could do to help. Archer posted information online and via e-mail and social media about what supplies people could donate: everything from beef jerky to baby wipes, antibacterial soap, and rubber gloves. 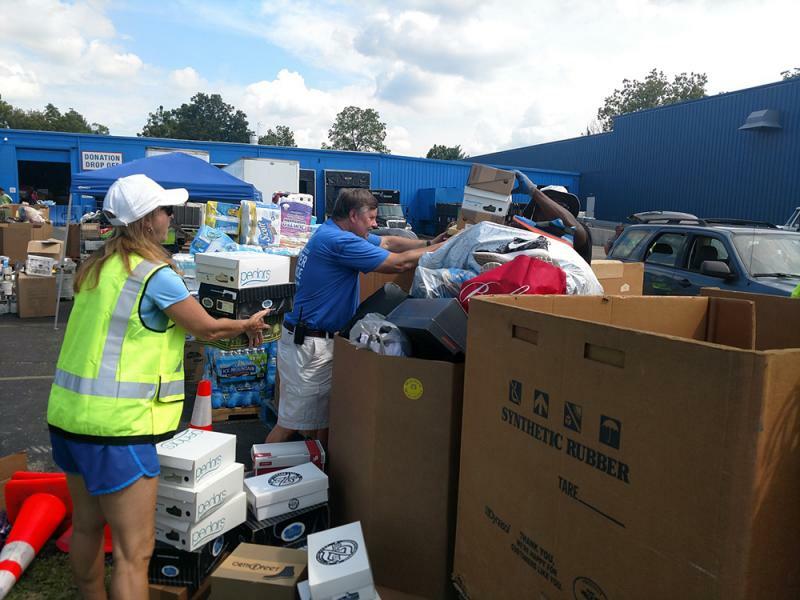 The organization encouraged volunteers to come to the warehouse to help sort disaster relief supplies, or even to write checks (100 percent of such donations, the website assured, would go directly toward hurricane relief, per Matthew 25:’s usual procedures). By late Monday, August 28, the decision was made: although the weather would still be “volatile,” Archer said, Matthew 25:’s initial disaster relief response team would head to Texas at noon the next day. They’d be taking relief kits like the ones that group of P&G-ers assembled in May. Matthew 25:’s first responders handed the kits out to anyone who needed them as they simultaneously assessed how the organization could best help. “Assembling the kits is meaningful because you know it’s going straight to somebody in need,” P&G Finance Manager Cynthia Brusman said, reflecting on the 1,700 kits she and her peers completed that day in May; her words rang truer in September than before. “I can’t imagine being displaced from my home and not having things we take for granted each day.” At first glance, a tube of toothpaste or a bottle of lotion might not seem like much, but both go a long way toward making people feel human when they’ve just lost everything they own. It didn’t take long for Mettey to realize that his new method of acquiring landfill-bound goods and utilizing volunteers to sort it all out could help in more places than just Nicaragua. Soon, he was shipping out humanitarian and disaster-related aid both within the United States and to 60 countries across the globe. People at Matthew 25:, in turn, began gauging milestones not only by year and quantity of goods shipped, but by natural disaster. Nicaragua’s 1998 hurricane, Mitch, was the first major disaster to which the organization responded, says Archer (they sent more than 800 tons of relief to survivors). And 2005’s Katrina—a Category 5 Gulf Coast hurricane that left 1,833 Americans dead and caused $135 billion in damage—was the event that helped the organization firmly establish its template for implementing relief. Mettey sent his son Tim to greater New Orleans right after Katrina hit so he could scout out who needed help and what Matthew 25: could send. There, Tim discovered thousands of people in need who weren’t being reached. “You had long lines of people waiting for nothing,” he said. “There was such a big disconnect between organizations or the government and helping people.” Rather than dumping products in the hands of other organizations and wondering if they’d ever make it to people in need, Matthew 25: staffers started going “door-to-door handing out supplies,” says Tim, “because you don’t want to worry about waiting in line when your house is destroyed.” In the next three months, Matthew 25: would ship more than 90 containers of aid to the region; within a year they’d ship roughly 140 containers in all. Now, the organization still sends a small advance team of staff members (equipped with tarps, cleaning products, and P&G disaster relief kits) and those first responders still go door-to-door searching for people who need help. But the organization also sets up distribution trailers and several other supply trucks in a Walmart or Home Depot parking lot—“anywhere that’s the center of the disaster,” says Tim. The other crucial step? “We find people who are already on the ground who have the ability through their local partnerships to get the products out to people who really need them,” says Archer. These “people on the ground” are what Matthew 25: refers to as local partners—mostly churches and nonprofits. “If one group is unable to take too many supplies there may be another that can take them,” adds Disaster Relief Coordinator Williams. “It’s about doing our due diligence and finding the right place.” Plus, forging such partnerships during times of extreme need can lead to the kind of long-term relationships Matthew 25: treasures most: the opportunity to supply ongoing humanitarian aid in “normal” times as well (this helps those local partners get a steady stream of supplies and establishes a relationship should Matthew 25: need to return, which has unfortunately been the case in New Orleans, says Archer). Part of what makes Matthew 25:’s business model unique is that they don’t always know what they’re getting with each donation. (“We know that if we’re picking up from Cintas it’s going to be mostly clothing,” says Archer. But “it could be all pants, it could be all shirts, it could be aprons.”) In any case, most everything they receive is processed, repackaged, and shipped back out again within three weeks. Machine guns and bandits aside, Dilg’s job seems overwhelming; sure, corporate logistics people do this kind of thing all the time. But they know exactly what products (and how much of each) will be coming and going at any given moment. Matthew 25: gets a general heads-up on donations, but for the most part, they’re winging it every day. This is challenging, considering Matthew 25: receives between three and six truckloads of new product every business day and works with more than 1,000 recurring donors each year. What’s more, their regular donation processing activity continues even when disaster strikes; people just get shifted around to compensate for staff who leave to work the disaster. One thing most people don’t know about the organization is how extensively Matthew 25: works within the U.S. Between 25 and 40 percent of all goods Matthew 25: acquires, says Tim Mettey, “stay here in the United States.” Last year alone, Matthew 25: sent 184.5 containers of aid to 26 different states. 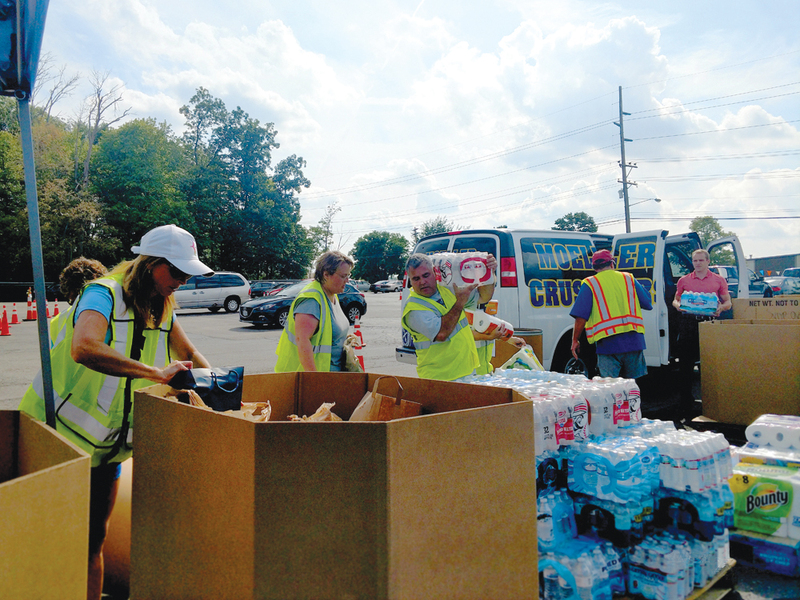 The organization has a long-standing relationship with Native American groups in the western U.S., and as far back as 1997 was shipping supplies to flood victims in Portsmouth and Manchester, Ohio. Today, the organization donates to more than 60 greater Cincinnati organizations, ranging from the Shelterhouse to Crayons to Computers and Bethany House. A lot has changed at Matthew 25: since Wendell Mettey founded it a quarter century ago, and a lot has stayed the same. Mettey’s “green” tendencies have become a way of life at Matthew 25:—from plastic and cardboard packaging to vulgar T-shirts, Matthew 25: recycles almost everything it can’t pass on to someone else. The organization’s thriving volunteer program continues as well; early on, says Archer, it was a big deal if 150 people donated their time over the course of one month. In 2016, the organization—open for business Monday through Saturday—saw nearly 1,300 volunteers a week of almost every age, race, color, and creed. That’s 66,000 people in one year. Tim Mettey has replaced his father as CEO. (“I don’t know when,” says the younger Mettey, clad in sandals and cargo shorts one workday last July. “Maybe five years ago? Four?”) His father is still president and a large presence at the organization, though health issues keep him working remotely most days. Matthew 25: is now located in its 10th and final—Tim swears—warehouse-slash-headquarters building. They purchased, thoroughly cleaned-up, and moved into the space (aptly named The Center for Humanitarian Aid and Disaster Relief) in 2004, having left the prior nine mostly because they outgrew them. The nonprofit has ventured into new areas that specifically help and educate others about developing countries: manufacturing notebooks to distribute at impoverished schools globally, recycling paint (Matthew 25:’s special blend of Rainbow Paint is “one of the most highly demanded products we have,” says Archer), and manufacturing a micronutrient food supplement called Grow Right, which they’ve distributed in Haiti and elsewhere. Matthew 25: financially supports the construction of homes in developing countries and water purification in places where it’s undrinkable. They organize and take mission trips and sell the wares of third-world artisans in a new gift shop next to their warehouse. By Tuesday, August 29, at 11:30 a.m.—five days after Harvey hit land—the line of cars at Matthew 25:’s PD entrance was backed up onto Kenwood Road. Everyone had been riveted by TV and social media images of first responders and regular citizens alike navigating Texas streets in boats and whisking displaced people off to makeshift shelters in libraries, convention centers, and furniture stores. Any place dry. People here just wanted to do something—anything—to help. One woman passed a check to a Matthew 25: worker through her open car window. Others arrived carrying garbage bags of bedding and clothes, gallon jugs of water, and shopping bags full of nonperishable food. One man walked up carrying a single plastic Kroger bag. Matthew 25: workers took it all. As each empty gaylord in the parking lot filled, it was toted off to the warehouse and replaced with another. At noon, a policeman stopped traffic and a convoy of seven trucks, Matthew 25:’s initial disaster response team, began the journey to south Texas. Williams was driving the first—a pickup towing a generator. They didn’t know where exactly in Texas they’d land, Tim Mettey told a local news reporter on camera. They’d start somewhere north of the damage, living in and distributing supplies from Matthew 25: campers, washing survivors’ clothes in the Tide Loads of Hope truck (a free mobile laundry unit donated by P&G and staffed by Matthew 25:-ers) and handing out ice from Matthew 25:’s mobile ice truck and clothes and personal care kits from Cintas and P&G trucks. As the waters receded, they’d move closer, Tim said, and send word back to the Blue Ash warehouse regarding what supplies should be sent down next, via semi-truck container. Given that the storm was on track to surpass Hurricane Katrina in damages, Archer said Matthew 25: was committed to help for the duration. Months at least. Likely a full year. Never mind that Matthew 25: had already begun tracking the seeds of what would become Hurricane Irma, the most powerful storm ever recorded in the Atlantic Ocean. Never mind that nobody even knew about Hurricane Maria, which would pummel Puerto Rico just 10 days later. Matthew 25: was already amassing extra disaster relief supplies, just in case. One of many sobering things in the face of so much devastation were the stories of people who survived Harvey with little more than the clothes on their backs but who still came out grateful and looking to help others any way they could. This, say the people at Matthew 25:, is a common occurrence when natural disaster strikes. In a world that felt so divided just days ago—over race, politics, and seemingly everything else—this is a kernel of hope. As the last truck in the convoy pulled out onto Kenwood Road, a warehouse staffer clad in a Matthew 25: T-shirt already marked with dirt and sweat watched and clapped. “It’s all worth it,” he said, smiling, to nobody in particular. Then he turned and headed back to work. Next articleWho Will Be Coaching the Bengals Next Year?